In this online coliseum mode, a simulated Japanese (JPN) and North American (USA) player battle one another. February 3rd, 2016. According to Famitsu, Bandai Namco Entertainment announced that in commemoration of Digimon Story Cyber Sleuth's international launch, an update to the Japanese game will be rolled out on February 5th, 2016, at 5:00 PM JST. The 1.03 version update patch will add the international hard mode, new game+, and the ability to be matched with players from all over the world, so that tamers will be able to test their skills against one another regardless of whether they're playing Sleuth in Japan, North America, or Europe. Although Bandai has not stated this explicitly, the patch will likely contain the data for the English-exclusive Beelzebumon Blast Mode and Cherubimon Vice. The North American copies of Cyber Sleuth that went out on the 2nd are compatible with the Japanese game for the ranked multiplayer mode, drawing from the Japanese leaderboards for the game's list of top 100 Digimon tamers. 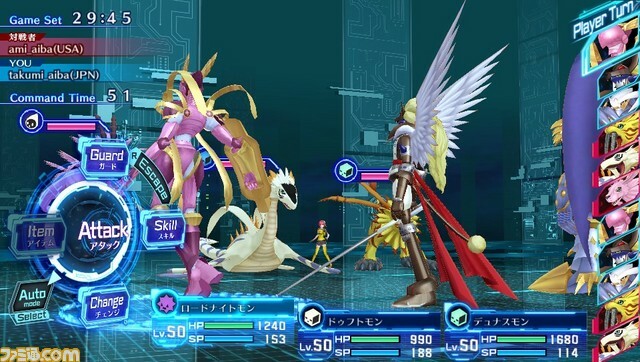 Patching in Blast Mode and Vice would ensure total compatibility between regions, and equal access to those Digimon by Japanese tamers. Cyber Sleuth has a small but dedicated online community in Japan, with some players continuing to remain active even a year after its original launch date. cherubimon is not out for jp version? ?